In addition to having very simple husbandry requirements, crested geckos (Rhacodactylus ciliatus) are relatively docile lizards that can learn to tolerate regular, gentle handling. While your gecko will never sit on your shoulder like a parrot or monkey, you can acclimate your crested gecko to brief handling sessions, and with enough patience, get him to hang out on your shoulder for a bit. Crested geckos should be at least 5 to 6 inches long before beginning handling sessions to prevent undue stress. 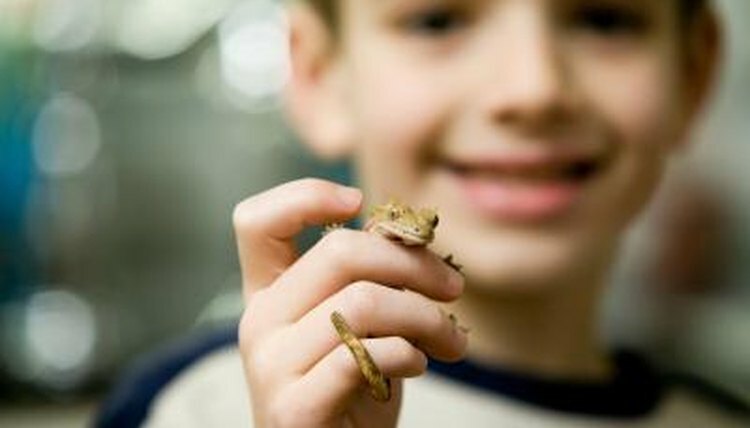 When you set out to handle your crested gecko, be sure that the room is free of distractions, such as children and other pets. Clear a place on the floor to sit so that your pet will not fall far if he decides to jump. The way you remove your lizard from his cage has a strong impact on his disposition -- if you begin by frightening your pet, it is hard to calm him down later. Open the cage slowly; rather than reaching your hand in to grab his body, place your outstretched hand right in front of him. If your gecko runs from your hand, slowly repeat the process until he allows you to put your hand right in front of him. If your lizard feels comfortable and curious, he may lick your hand. Once he has adjusted to the presence of your hand, gently slide your hand under his chin. By gently lifting him under the chin, he will likely crawl right into your hand. Once he is in hand, sit down with him slowly. Hold your gecko in your hands for a few minutes to let him adjust. Lift him slowly to your shoulder, and try to encourage him to walk from your hand to your shoulder. While doing so, try not to look directly at the lizard. If your crested is comfortable, he will likely remain on your shoulder for several minutes. If your lizard feels nervous at any point, he is likely to attempt to flee. When doing so, he is either going to jump down to the ground, or he is going to seek safety by climbing higher -- right up onto your head. Don’t panic if this happens -- your gecko isn’t launching an attack at your face, he is trying to climb to safety. However, it is important to exercise caution, as their small claws could scratch your face or eyes. Each time he climbs or jumps off, gently put him back on your shoulder. Over time, he will become more and more comfortable on your shoulder, remaining for longer as you progress. Crested geckos autotomize their tails very readily; unlike some other lizards, they will not regenerate their tails. While this won’t cause them great hardship, it may compromise their agility and look unsightly. While gentle handling is unlikely to cause most crested geckos to drop their tails, it is an important possibility to consider if keeping your lizard’s tail intact is important to you.